Usual Lead Time is 8-10 Weeks. CBC-Heavy duty and Standard Series ship LTL Freight Collect. NOTE: This is a customized product and is not returnable. Please contact us if you have any questions regarding the suitability of this product to your application. We will be happy to assist you in determining the Coilbridge Conveyor size for your application. Just give us a call at 1-800-276-5467, or download the Selection Guide Worksheet and e-mail us at sales@productivityresources.com. Several of our Account Representatives have over 15 and 20 years experience. This standard duty series CBC-18-4 model CoilBridge conveyor is ideal for medium duty coil fed press.. This standard duty series CBC-24-4 model CoilBridge conveyor is ideal for medium duty coil fed press.. 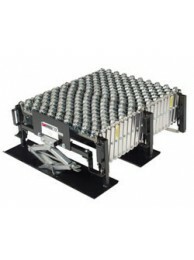 This standard duty series CBC-30-4 model CoilBridge conveyor is ideal for medium duty coil fed press.. This standard duty series CBC-18-8 model CoilBridge conveyor is ideal for medium duty coil fed press.. This standard duty series CBC-24-8 model CoilBridge conveyor is ideal for medium duty coil fed press.. This standard duty series CBC-30-8 model CoilBridge conveyor is ideal for medium duty coil fed press..